The most likely origin of the word “condom” comes from the Latin condon, which means “receptacle” in English. However, other explanations are aplenty. Some theories maintain that the word is derived from a purported “Dr. Condom” or “Quondam” who was employed at the court of King Charles II of England. The doctor is believed to have manufactured devices for the lascivious king. There is a large variety of condoms to choose from. The word “condom” has been on everyone’s lips since the early 1980s as an awareness campaign for AIDS gained momentum. On the other hand, the condom as the world’s oldest device used for the purpose of preventing and/or transmission of sexually transmitted diseases (STDs) still gives rise to a lot of questions in terms of its origin. 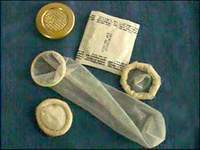 Most modern condoms are made of latex or polyurethane. Condoms can also be made from one of the oldest materials used for the purpose, namely lambskin, which is made from lamb intestines. In recent decades, condoms have become available in a wide range of colors, shapes and thicknesses. Some stimulating properties which are sometimes added to the condom design include enlarged tips, ribbing or studs. It is worthy of notice that a manufacturing technique for condoms has remained largely the same over the last 50 years. A cylindrical glass mold is dipped into a container filled with liquid latex and heated. Condoms are rinsed once they take a proper shape. Vulcanizing agents, stabilizers and other components are added later to improve elastic properties and tensile strength. Condoms are lubricated, rolled up and packaged at a final stage of the manufacture. Condoms are tested for holes with an electrical current. Batches of condoms are also selectively tested for breakage with pressurized air inflation tests. This entry was posted on Sunday, February 18th, 2007 at 11:39 pm	and is filed under Advice and Guide, Funny Junk, Interesting Stuff. You can leave a response, or trackback from your own site.